Instead of interviewing somebody for episode 5 of The BOOM Podcast, speaker and Amazon bestselling author Jeff Yalden reflected on his experience of participating in the Dirty Myrtle Mud Run in Myrtle Beach, S.C. last month – and weighing on his heart was a message he wanted to share, the essence of what the BOOM is all about. 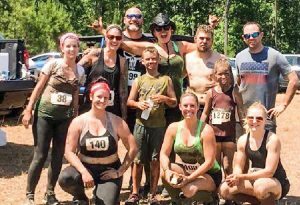 The Dirty Myrtle Mud Run is a 5K race – 3.2 miles with obstacles along the way – and Yalden wasn’t feeling it on the morning of the race when his fiancée Janet Kelly woke him up. But that morning, Yalden was not motivated – he wasn’t feeling strong, flexible or energetic – but he remembered his primary goals for the year when it came to his fitness: Be consistent and show up. “I didn’t want to do it. I was nervous. I was scared – but you know what? We all go through that. We all go through times of self-doubt, but I made a commitment,” he said. This was about getting his blood flowing and his body moving. He was going to be outdoors in the sun, building up a sweat and seeing his friends. And the fact that it was a beautiful day brightened his outlook tremendously. “I didn’t have any expectations of what place I would come in. I wanted this to be more about self-care than it was about the end result,” he said. He showed up – and the BOOM had everything to do with that. “The BOOM was that I got up and went. The BOOM got me off the couch – and while I was doing this, I saw other people doing the obstacles. I wasn’t jealous that they could do more than me because that’s not the BOOM mentality. The BOOM mentality is that you are proud of people and you want them to succeed every day,” he said. Showing up is the magic bullet – and is a major part of the BOOM. Yalden illustrated his point with a story about basketball. According to Yalden, the point is that we tend to keep the ball in our hands. “We’re afraid to dribble for the fear that the [ball] might be taken away. We’re afraid to take the shot for the fear that we might miss whatever shot we take. But if I take the shot, I have a chance of that shot going in. Yalden said he came to realize that we are all at different points in our journeys toward being the best that we can be. Be patient in the process. And if that means simplifying and streamlining along the way, don’t hesitate to do just that. In your twenties, it’s all about self – about that job, that college degree and how much money you are making. In your thirties, it’s about success. You want people to perceive you as being successful. In your forties, it’s all about significance. It becomes a little less about you and more about that significant contribution that you can provide to your community. When a person enters their fifties, it’s about building a legacy. It’s not about what you go through. It’s about what goes through you when you go through it that makes you who you are. In this episode of the BOOM Podcast and in his Amazon bestseller, BOOM! One Word to Instantly Inspire Action, Deliver Rewards, and Positively Affect Your Life Every Day, Yalden says the BOOM is not about being in a place where people envy you. The BOOM is about wherever you are in your journey – and your journey is different from everybody else’s journey. And Yalden is happy about the outcome of his day at the Dirty Myrtle Mud Run. Click HERE to listen to Episode 5 of The BOOM Podcast. For details about the BOOM Podcast, go HERE. GRAB your copy of Jeff Yalden’s Amazon bestseller, BOOM! One Word to Instantly Inspire Action, Deliver Rewards, and Positively Affect Your Life Every Day. JOIN the BOOM Facebook Community. 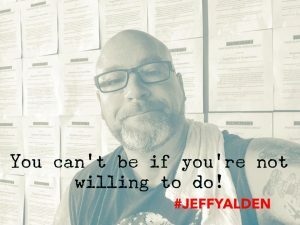 For everything about Jeff Yalden, click HERE.